I'm an obsessive magazine reader. In fact, my constant jones for magazines is almost as bad as my lifelong addiction to cookbooks. At any given time you can find at least a dozen magazines, just within reaching distance, piled high on my night table. One of my favorites is Los Angeles Magazine and when their Farmer's Market edition arrived in the mail this month, I was like a baby being given a huge piece of candy. One of the best articles in the issue was an apples to apples comparison (no pun intended) of shopping at an everyday chain grocer, an upscale chain grocer and a farmers' market for the same amount of vegetables for a roast vegetable dish. The goal of the experiment was to see not only which vegetables cost the least, but also tasted the best. It probably comes as no surprise to you that I wouldn't have written this post unless the farmers' market was the hands down winner! It won handily, for both cost and flavor! That made me especially happy since I frequently confront the misperception that farmers' markets are more expensive than super markets. 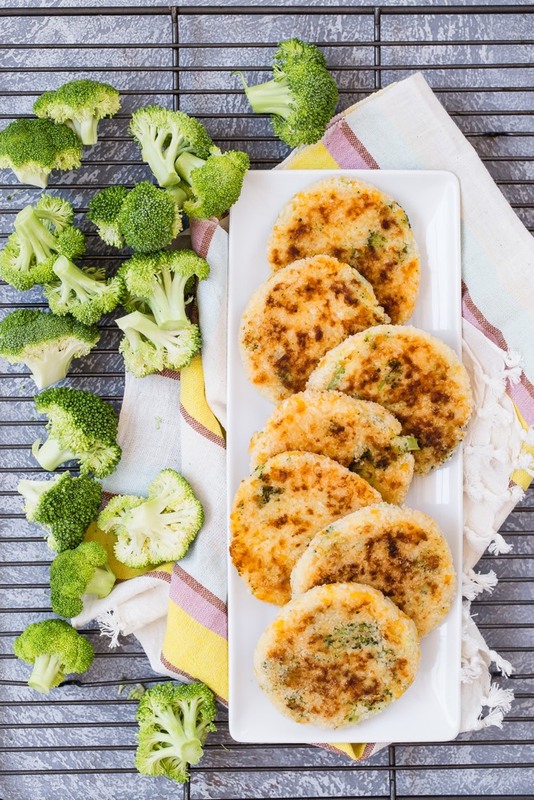 At this time of year when you can easily find things like potatoes, broccoli and cheese to make this delicious side dish, I hope you can find them where you're able to get the freshest produce possible! 1. Place the potato cubes in a steamer pot over boiling water and cook for 8 minutes. 2. Add the broccoli to the steamer pot and steam the vegetables for an additional 2 minutes, or until they are fork tender. Then, remove everything from the pot and allow them to cool. 3. Mash the potatoes in a large bowl and chop the broccoli florets into bite-size pieces. 4. Add the broccoli, cheese, panko, salt, egg, garlic and onion powder to the bowl and combine. 6. Using an ice cream scoop or 2 tablespoon measure, roll the mixture into balls, coat them in the panko and then shape each one into a small patty. 7. Heat 1 tablespoon of oil in a skillet over medium heat, place the patties in the skillet and press down with a spatula to flatten a little. 8. Pan-fry for 3-4 minutes on each side until golden. To Freeze: After Step 6, place the patties on a baking sheet and freeze for one hour. Transfer the patties to zipper bags and label. Defrost when ready to use and cook following step #7. Perfect! I was just looking online to see what I could cook for dinner tonight and I just happen to have all of these ingredients in the house! Thank you! These look like a good way to get my kid to eat broccoli, something her normally wont touch. I have all the ingredients on hand! Will try these tonight. Thanks so much! Looks delicious and tasty.. I am making this today for sure. I have a child with an egg allergy but would love to try this recipe...any suggestions for an egg replacement? You can also take 1 tbsp of flax seeds and puree it with 2-3 tbsp of water to make a puree that replicates beaten egg. I haven't tried it in this recipe, but it's worth a shot. Oh, do those look yummy! These will definitely be on our menu this week. All of my daughter's favorite veggies too! Interesting. Will definitely try this one. My boy also loves your Broccoli and Carrot Orzo recipe. I make that once in a while, especially in a pinch since it's so easy. I just made these delicious. I tweaked it a little I happen to have mozzerella cheese on hand so I used that instead. They turned out delicious. I think my kids are going to love them. So happy, mozzarella is a great idea! These are my daughter's favourites - I've been making them for months! can i omit the cheese. My daughter has a dairy allergy... we use vegan gourmet cheese for pizzas but it is highly processed, so i dont like to use it often. thanks! Yes, you can use vegan cheese or you can leave it out. i have found that a great way to mince up the broccoli for these kinds of recipes it to just use a box grater and grate the broccoli florets. then you actually don't even need to pre-cook them, the bits are small enough to cook in the frying pan. Making them as we speak,,,, I was out of bread crumbs so I toasted up a bunch of bread ends and ran them through the food processor hope they work just as good. Would cauliflower work instead broccoli? With 3 heads of broccoli in the garden that must be eaten pronto... I will make this for lunch tomorrow and some to freeze. They sound fab! Made these last night and called them crabby patties. Kiddos loved them! Even my seven yr old who has refused to eat potatoes thus far his entire life ate these patties up without blinking. Awesome. Also I combined some salsa and sour cream for a dipping sauce...Cant wait to make it again! Made those for my boys for dinner tonight, my 11-month-old loved them, he ate almost 4!, and my picky 3-year-old took few bites. My husband and I thought they were tasty and I loved that they were easy and quick to make. We'll make them again soon! can i replace potatoes w/ some white beans (cooked) w/ the same outcome? We just made these tonight and they were awesome! My 2 year old loved smashing the potatoes and stirring the ingredients. He even enjoyed eating them, which really surprised me since he doesn't like potatoes of any kind! Thanks for all the awesome recipes. We love them! We have also made it with sweet potatoes and leftover mash potatoes. They came out great. Could these be baked in the oven instead of fried? Wondering the same about baking. Made these yesterday for lunch for my one year old and myself. I added some chopped spinach and very finely chopped mushrooms for extra veggie variety and some Parmesan cheese (I used a little less grated cheddar than was called for). They were fantastic! My little guy has been starting to turn up his nose at veggies (I think he's had a few too many treats over the holidays) but he devoured these as fast as they were coming out of the pan. How do you get yours so thin though? When I tried to flatten them the edges crumbled and fell apart in the pan. They ended up more like flattened nuggets (didn't hurt the flavor at all but I'm wondering what I was doing wrong). 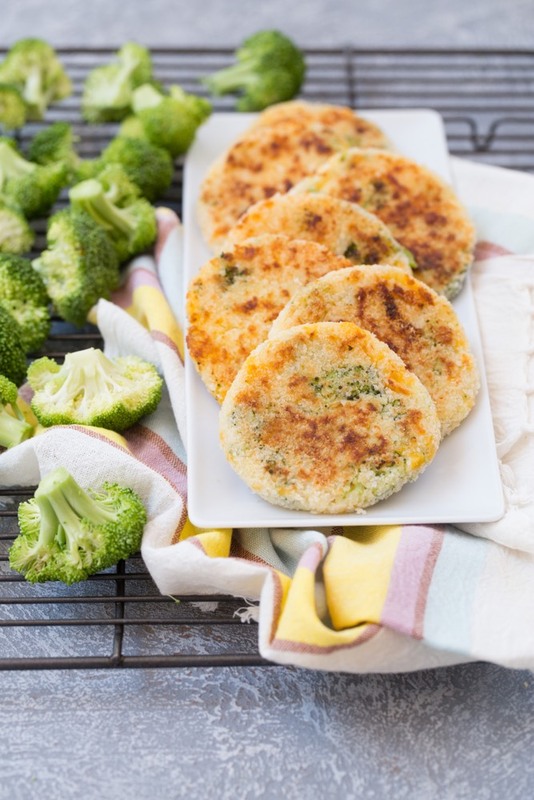 Definitely going to try these... HECK I might even start eating broccoli!! Thank you! Just made these for lunch for my 16 month old daughter. She didn't want them at all. But I have a feeling she wasn't very hungry. Will save for dinner tonight and try again. I thought they were yummy. I did only get 9 1/2 out of this though, not 12. And that was using an ice cream scoop that wasn't completely full. Had these for dinner last night with corn on the cob on the side. They were all devoured in minutes. Fantastic. My daughter (just turned 1) generally eats whatever I give her- with the exception of broccoli. For some reason, she shoves it away every time. But she just devoured these! Thanks. This is my wife's account (and favorite recipe site), but i have to say, these came out amazing. My 12 month old fussy-eater ate half the batch for lunch today. The wife is making one of the stir fry recipes tonight ( http://b12.ba4.myftpupload.com/2011/06/13/stir-fried-brown-rice-chinese-noodles/ ), hopefully with similar results. When I used the ice cream scoop I only got six patties, but that's probably because 2 tbsp. is 1 oz. and a standard (American) ice cream scoop is 2 oz. The 2 oz. version reminded me of a burger patty, which I will be sure to re-utilize. Can you bake these? What time and temperature? I'm really excited to try this recipe!! I haven't tried baking them, but if I were I would do 350 for probably 15 minutes! What a great recipe. Never witten a review before but you can't go wrong with this one. I am making this right now as an appetizer for a get together tonight! YUM! I bet rice would work! Give it a try and let me know how it comes out! Can i freeze these before frying stage? Yes! If you look at the bottom of the recipe directions there is instructions for freezing! I changed it to say, \"To Freeze\" so it is easier to see! :) Freeze them in a single layer on a baking sheet for 1 hour (until they are frozen through) then transfer to a zippered baggie or other freezer appropriate container. When ready to cook the, defrost (I like to let them defrost in the fridge. If you put them in there in the morning they should be ready by dinner time) and cook according to the recipe directions! Thanks so much for this recipe! These were soooo good, my husband and I finished the last batch before the kids even got to try any. Whoops. I'm making them again tonight and promise not to eat them all this time. (BTW - found you on Pinterest). Thanks again! I haven't tried an egg replacer in this recipe. The egg holds it all together so I bet 1 tablespoon of ground flax mixed with 3 tablespoons of water would work! Can you freeze them after the final step? We had leftovers and I wanted to see if you had tried it that way? I haven't frozen them after baking, but I'm sure that would be okay! I would like to join your mailings. Thank You! Yes, the egg cooks through! Great recipe--thank you! I didn't coat them in the extra panko (my son's been off breading lately) and he loved them. What a relief since he's been pushing away almost everything this week!! I was wondering, can these be reheated? I want to make these and send with my one-year-old to preschool. They only have a microwave. . . what do you think? I think a few seconds in the microwave would be okay! Too long and they'll probably get rubbery, though. Do you know the calories protein etc? We are working on getting nutritional information for all these recipes! Coming soon! These were really tasty, but I had a very hard time with them falling apart and sticking to the pan. I think next time I'll add more panko in Step 4. I also had a hard time forming patties at first -- I added chickpea flour and it solved the problem. I used turnips instead of potato. Still good! Did you change this recipe? I remember making them a few months ago and baking them..I don't remember the recipe requiring potatoes either..I just wanted to tell you that they came out amazing!!! YUM! They are SO good! thank you!! Do you use fresh or frozen broccoli for yours? Or does it matter? Use fresh broccoli! Frozen, once defrosted, is too wet! I used my microwave steamer and pureed the broccoli so my picky eaters couldn't see it. And I used frozen to I used frozen broccoli. They turned out great and my picky 2 year old and hubby are eating them! Thank youuu so much for the recipe. My picky 18 month old took this and said \"yummy!\". Please keep recipes like this coming. Thank you for this recipe! You are a genius when it comes to toddler meals. Mine normally flips out over even normal things kids love like rice, potatoes, and corn. He lives on chicken nuggets and sunbutter/jelly sandwiches, which is not what I strive for at all. But you know what? He ate these and loved them, and therefore, I love you for making day have one less fight over food and for getting something healthy in his little body. I am telling every mommy I know about your website. Thank you, thank you, thank you! These are great! I cook them in my 'george foreman' grill- like a sandwich press. Then I don't have to turn them and they seem to stick together better. I just baked these and they turned out great!! We love it! I have a 16 months girl! Good recipe to be sneaky with the fish ;) thank you! These were extremely easy, fast, and yummy! Love these! I've been making them for years but am only now paying attention to the nutritional info. Can you confirm what a service size is? Thanks! My baby loves these, and I make them often. but I was wondering can you use sweet potato? I figured I would change it up a bit since she likes sweet potato. Sweet potato should work just fine! So glad these are a hit!